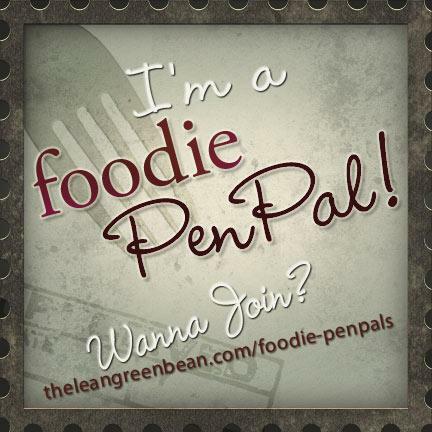 This month, after taking July off, I participated in Foodie Pen Pals hosted by Lindsey at the Lean Green Bean. My amazing pal treated me to tons (!!) of amazing things. You’ll have to trust me. Although I photographed all the goodies, I failed to plan ahead and the photo was still in the camera when my husband took off for his adventures at the Burning Man festival in the deserts of Nevada. Unfortunately, I didn’t document it all either, so I’m going from memory and labels. My favorite part of the package was a bag of dates. I offered some to my kids who did not enjoy them AT ALL. No worries – more for Sheila. Also included were jars of salsa and bruchetta that I haven’t taken the time to try. My pal also sent some spicy mango that traveled with the photos of it because Eric absolutely loves mango. I’ve been snacking on spiced almonds and giant white beans. We all shared the fruit and granola bars. I believe there were other items [and I know I loved everything], but I’m having memory issues due to migraine pain. When the camera returns, I’ll update.